This product is available in Ebay, Snapdeal, Flipkart. 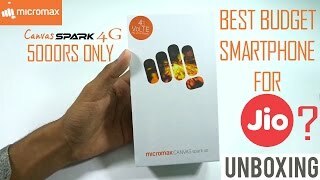 At flipkart.com you can purchase Micromax Spark 4G (Cosmic Grey, 8 GB)(1 GB RAM) for only Rs. 4,099, which is 18% less than the cost in Snapdeal (Rs. 5,011). 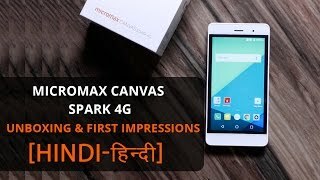 The lowest price of Micromax Spark Vdeo (8GB) 4G VoLTE was obtained on April 22, 2019 1:39 am. This is just a short Review in which I will explain the user experience that I had with this phone in 2 days of usage.1) The processor is 1.0 GHz quad-core ( No idea about the version ) which is sufficient for normal multi-tasking.2) RAM given is 1 GB out of which half is always consumed by system apps.# As already said, this is just sufficient for normal Usage.3) Memory inbuilt is 8 GB which is too less, but fortunately there’s Memory expansion option upto 32 GB.# With 32 GB card installed there’s Lag detected in some applications when multi-tasking is done.4) Has NO NFC and OTG.5) Dual sims works fine.6) Display is above Par considering the price Tag.7) Battery Life is fine compared to price Tag.# Averagely it lasts upto 1 days with normal calling and 3G use.# Wifi use lasts upto 7 Hours.8) It runs on Android 6 right out of the box.9) There’s bit Heating issue when continuously used for more than a Hour.10) Finally camera is average.VERDICT :Its a good phone, you get what you pay for. Just make sure there’s service center near you if you are planning to buy this phone.Infocus Bingo is also a good option against it. For basic uses i.e. calling, SMS, using Chrome with 2 to 3 tabs open, playing candy crush saga, the phone is good. But the battery life is pathetic, and sometimes the touch is in accurate. But if you want a 4G phone for basic calling and data uses…go for it.. Battery only 1800 mah. Not interested to buy..
RING TONE VOLUME LOW.HOW CORRECT IT.